There is something about tart cranberries as a side dish with any meal that always seems like a great match. From breakfast to dinner its always a great match. I loved the canned version as a kid but my grown up homemade version is a crowd please that takes not effort. 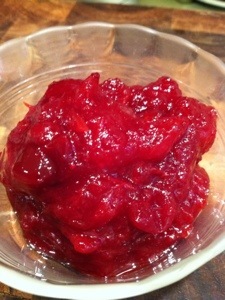 Place cranberries, sugar, orange juice, zest and wine in a small pot. Cook on medium heat and stir continuously. The sauce will quickly combine and berries will start to pop. Its important not to cook longer then 15 minutes in order to save some of the pectin to keep the sauce firm. 15 minutes is plenty of time for the cranberries to cook down and for everything to combine. Remove from heat and allow to cool in fridge. Once cool add apple sauce and port.